The aim and scope of the Korean Journal of Oral and Maxillofacial Pathology (Korean J Oral Maxillofac Pathol) launched in 1967 which is to publish manuscripts of high scientific quality representing original clinical, diagnostic or experimental work in oral pathology and biology is published six times (end of February, April, June, August, October, December). 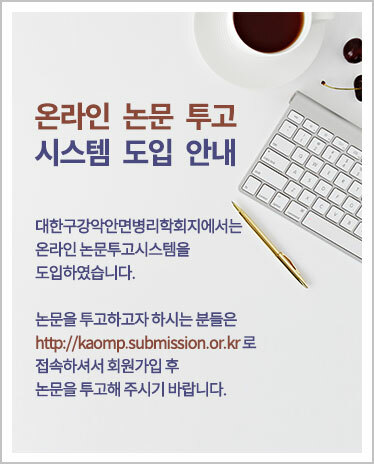 Full text PDF files are available online at http://www.kaomp.org. This jounal is circulated to all members free of charge. You can order a subscription of manuscript to publisher $100 per year. All bibliographical indexes and databases where the journal is listed in KCI. Publication office : Daejeon Dental Hospital, Dental College, Wonkwang University 77 Dunsan-ro, Seo-gu, Daejeon, Korea. Publisher : Yoon, Jung Hoon (E-mail: opathyoon@wku.ac.kr), Editor in Chief : Lee, Jae Il (E-mail: jilee@snu.ac.kr). Copyright © Korean Association of Oral and Maxillofacial Pathology. All rights reserved.